You can't have Easter without an Easter bunny. So why not make a whole family of Easter bunnies? 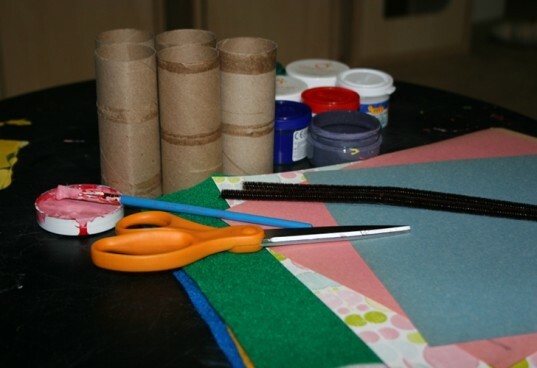 All you need for this recycled craft is a few toilet paper tubes, some paint and a few other craft supplies you probably already have. 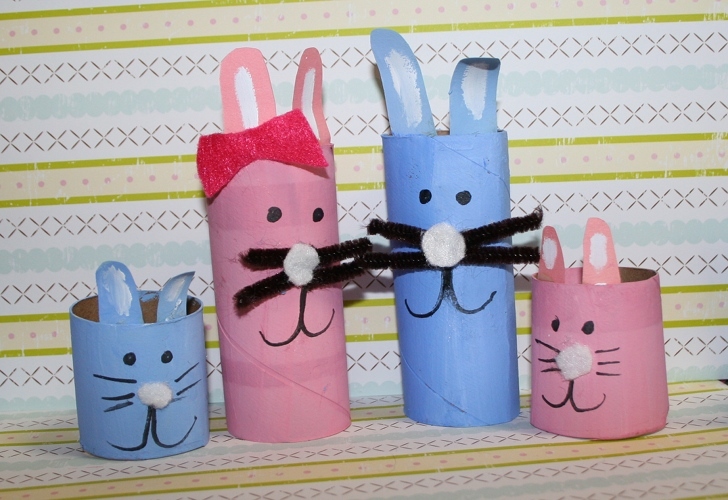 My 5 year old loved making these recycled toilet paper roll bunnies. They're easy to personalize and the possibilities are endless. 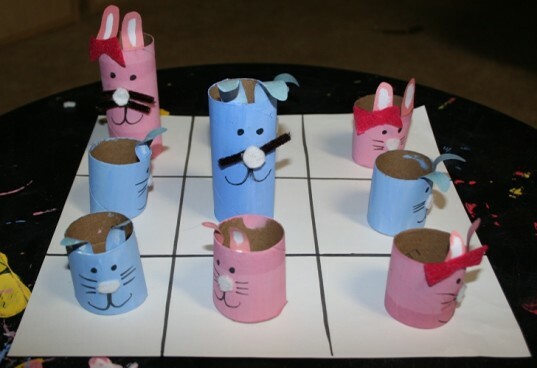 After we made our bunny family, we got the idea to turn them into a tic tac toe game - perfect for playing while waiting for Easter dinner or anytime. 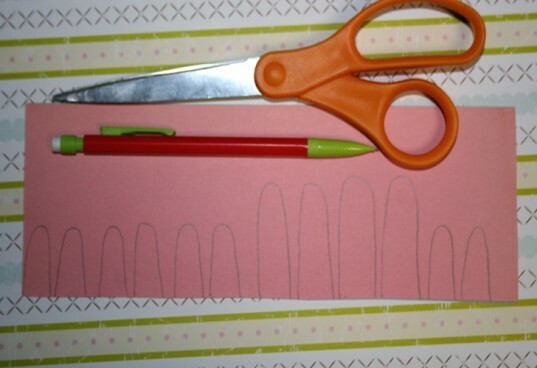 Draw the ears with a pencil on a sheet of colored paper that will match your bunny. If making adults and babies, make sure to make different sizes. When I cut the ears, I had the pink piece of paper on top of the blue piece of paper to save time. 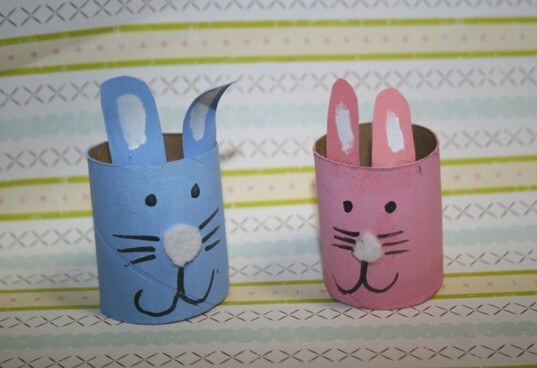 First, cut four of the toilet paper rolls in half to make the baby bunnies. Leave two full size – these will be the adult bunnies. We decided to paint blue and pink bunnies, so we mixed non-toxic white paint with blue and red to give them a pastel shade. We also painted the ears so they would be the same shade. 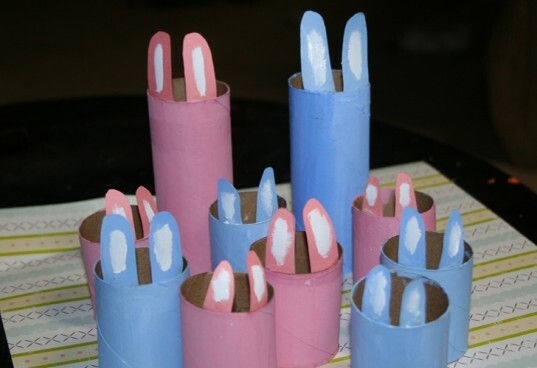 After the toilet paper tubes dry, attach the bunny ears to the TP tube bodies. Then, paint the white parts of the ears. After the bunnies are dry, decorate their faces. We gave the mama and papa bunny pipe cleaner whiskers and then added white felt noses. We thought the babies would look cuter with black marker whiskers, mouths and eyes. You can make bows for the girls and bow ties for the boys. You can use buttons for noses or pom poms. You can even make whiskers and mouths with wikki stix! The older your child, the more creative you can get with the faces. Want to make a game out of your bunnies? Take a 12″ x 12″ sheet of paper and using a ruler, draw two horizontal lines and two vertical lines to make your tic tac toe game board. Instead of X’s and O’s you can play by colors – or pink bunnies and blue bunnies! The youngest player gets to go first and places their bunny on whichever spot they choose. Then the next player makes a move with their color. The players try to get three colors in a row and the first one wins. First, cut four of the toilet paper rolls in half to make the baby bunnies. Leave two full size - these will be the adult bunnies. We decided to paint blue and pink bunnies, so we mixed non-toxic white paint with blue and red to give them a pastel shade. We also painted the ears so they would be the same shade. After the toilet paper tubes dry, attach the bunny ears to the TP tube bodies. Then, paint the white parts of the ears. Want to make a game out of your bunnies? Take a 12" x 12" sheet of paper and using a ruler, draw two horizontal lines and two vertical lines to make your tic tac toe game board. Instead of X's and O's you can play by colors - or pink bunnies and blue bunnies! The youngest player gets to go first and places their bunny on whichever spot they choose. Then the next player makes a move with their color. The players try to get three colors in a row and the first one wins.